Photo by Eric Liebowitz/Courtesy of HBO. 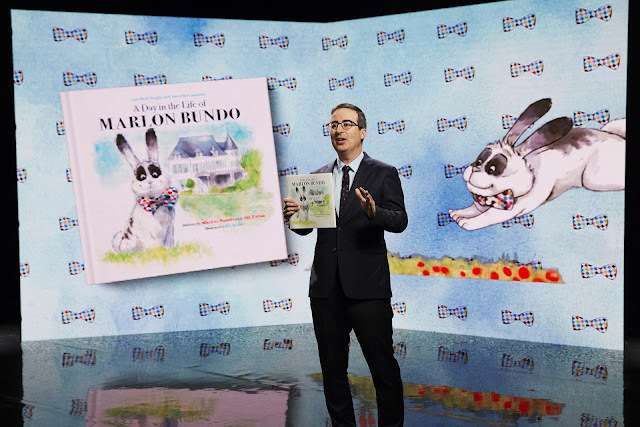 The results may be even more satisfying for Oliver on the children’s book chart, where the Pence joint is being outsold not only by the hardcover version of A Day in the Life of Marlon Bundo, but also by the Last Week Tonight creation’s Kindle edition. The Day in the Life of Marlon Bundo audiobook, featuring the talents of Jim Parsons, Jesse Tyler Ferguson, Jeff Garlin, Ellie Kemper, John Lithgow, Jack McBrayer, and RuPaul, is also Audible’s current No. 1 best-seller, beating out slightly more substantial audiobooks like James Comey’s A Higher Loyalty and the movie tie-in version of A Wrinkle in Time. This, of course, is no coincidence. Last Week Tonight’s bunny book, which follows a sprightly young rabbit named Marlon as he meets and falls in love with a dashing male rabbit named Wesley (and defeats a stink-bug bad guy that doesn’t think boy bunnies should marry each other, one who looks an awful lot like Mike Pence), would not exist were it not for the Pence family’s book, a gentle dramatization of life in the Naval Observatory from a bunny’s-eye view. See the full Vanity Fair article here. Charlotte [Pence] and her mother Karen Pence were on Fox Business Network with Maria Bartiromo to promote their new book when the host casually brought up the fact that Oliver’s parody book about a gay bunny—revealed on his HBO show Sunday night—had just knocked James Comey’s upcoming memoir off of Amazon’s top spot. Karen Pence stayed notably silent on the matter. But later, Charlotte Pence retweeted the Fox Business clip of her positive reaction to Oliver’s book. See the Daily Beast full article here. See yesterday's post that includes the full clip about Pence's LGBTQ views and how to get the bunny book from Last Week Tonight here.